A good water bottle is an essential for walking, running, cycling, and other forms of exercise. 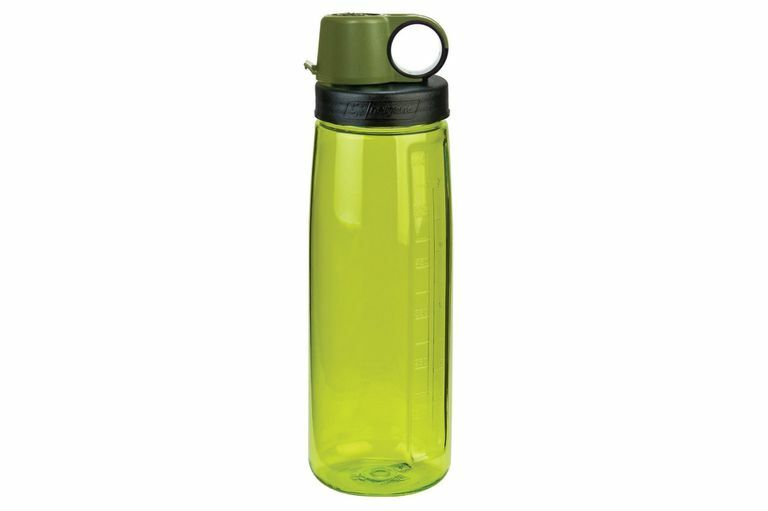 Nalgene has been making an excellent line of water bottles for hiking and exercise for decades. Their Nalgene Tritan OTG water bottle has been BPA-free since 2008. It is made with Eastman Tritan copolyester. The OTG stands for "on the go" and this bottle is meant for use for walking, running, cycling, and hiking. The OTG Tritan Bottle has a flip cap to close off the mouthpiece. It is designed to be able to flip it open one-handed as you might do when exercising. You may find it not as easy to open as you might like, but the mouthpiece is easy to drink from. You can really gulp down the water versus being stuck with the slow flow that you get from squeezable sports bottles. The side of the bottle has gradations in ounces and milliliters to help you keep track of your water intake. The OTG bottle is only available in a 24-ounce capacity. It comes in three colors but is clear to allow you to get a good view of what you are drinking and its level in the bottle. The markings can help you ensure you are drinking enough to replenish the fluids you lose during a long workout. The wide mouth of the bottle makes it easy to add ice cubes or powdered sports drink mix. That's important because cold water is more palatable and you are more likely to drink enough if you add ice. It also fits water filtration devices, which is a consideration when hiking. It is also easier to refill on the go at a water fountain or from a tap. The bottle is dishwasher-safe for cleaning. Or, if you want to clean it by hand with hot, soapy water it's easy to fit a brush inside. Be sure to clean your bottle well after each use. It's especially important if you use it for a sports drink or any drink that has sugar or fruit juice, as that can lead to mold growth. The top of the OTG Tritan Bottle has a handy loop you can use to hook the bottle on a clip or hook or dangle it from your finger. The bottle itself is a little too large for smaller hands to grip comfortably. But in any case, it isn't recommended that you carry a water bottle in your hand for walks of more than a few minutes, as that can lead to repetitive stress injuries. The bottle is shaped to fit into most water bottle holders on bicycles, exercise machines, and in car cup holders. The Nalgene OTG Tritan is made of clear, hard, impact-resistant Eastman Tritan plastic. As of 2008, of the Nalgene OTG Tritan is BPA-free even though it has a numeral 7 inside the recycling triangle on the bottom of the bottle. Years ago when BPA was common in plastic water bottles people were told to avoid bottles that had a 7 designation. But Nalgene reformulated their plastic to be BPA-free. It still has the 7 on the bottom because that relates to recycling, not BPA content. You can look for the BPA-free or Tritan designation when buying a new bottle. Do You Need a BPA-Free Water Bottle? Nalgene was one of the companies hardest hit by fears about BPA in polycarbonate bottles, as they had made their clear plastic polycarbonate Lexan polymer. They swung into action to replace Lexan with Eastman Tritan copolyester, which is BPA-free. However, if you have older Nalgene bottles that are more than 10 years old, they might contain BPA. It is wise to replace any older water bottles if you are unsure. Always replace bottles that are cracked or that can't be easily cleaned once soiled. People were concerned over reports that damaged clear polycarbonate water bottles might leach bisphenol A (BPA) into the water. Manufacturers are moved swiftly to provide BPA-free versions. Many water bottles have always been BPA-free, as they are made of opaque or semi-opaque squeezable plastic rather than the rigid, clear polycarbonate. If your clear plastic water bottle has a 7 inside a triangle on the bottom, it might be polycarbonate, although it could still be BPA-free. Bisphenol A (BPA): Use in Food Contact Applications, U.S. Food and Drug Administration.